Although I haven’t found this to be necessary nearly as often as Windbg was for me on Windows, it’s still somewhat handy to be able to look at a Python daemon or multithreaded program in GDB. I’ve had to set this up a few times now, and I’ve forgotten the steps each time, so here they are in one place. Step 1 - Get a debug build of Python. Step 2 - Fix the botched .gdbinit that comes with the Python source. The Python source comes with a .gdbinit file (Misc/gdbinit), but it’s broken in 2.5. Apply these changes, which will fix pystack to 1) work and 2) work on threads other than the main thread. Note that the locals still won’t work. I’ll post a diff that fixes those when I get around to doing that. 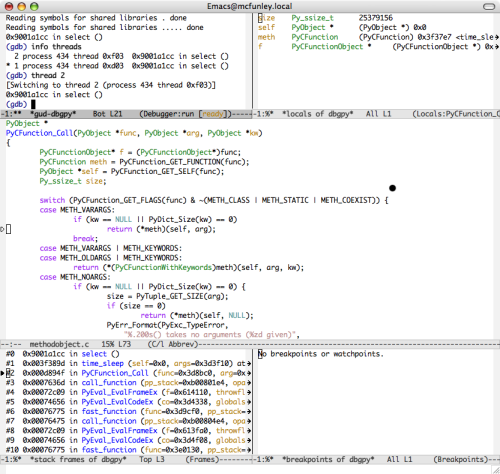 In the meantime it’s not too hard to poke through the python structures to get them. On OS X you can just copy the result of this to ~/.gdbinit. Some linux distros might be cranky about where you put this and where you launch gdb. Step 3 - Launch your program with the debug interpreter and attach. From the command line you can attach with “gdb /usr/local/bin/dbgpy [pid].” I like gdba mode in emacs (see below - M-x gdba, then the same kind of command line).